In recent years a new treatment tool has become available that offers unique therapeutic benefits to patients with knee osteoarthritis: Lower Body Positive Pressure (LBPP) Treadmills, like our own AlterG Anti-Gravity treadmill. Exercise therapy can be an effective tool for managing the symptoms of knee osteoarthritis, and delaying progression of the disease (ref1). For more information see our: Patient Guide to Knee Osteoarthritis and its Treatment. However, knee pain and muscle weakness arising from osteoarthritis can make normal exercise therapies such as walking and running untenable for some. For these individuals, bodyweight supported exercise therapy can be very beneficial. LBPP treadmills allow a user to walk or run at varying levels of weight reduction thanks to a computer regulated air pressure chamber that creates a buoyant upward force. The leading commercial LBPP treadmill is the AlterG Anti-Gravity treadmill (www.alterg.com). Prior to the development of LBPP treadmills, there were two conventional strategies used to unweight an individual during walking or running therapy: hydrotherapy (exercising in a pool) and body weight suspension harnesses where the user is suspended by straps above a treadmill. While these approaches have their benefits, they are not without limitations. The AlterG Anti-Gravity treadmill may offer unique benefits to patients with knee osteoarthritis over conventional bodyweight supported exercise modalities. Here we describe the advantages and disadvantages of each bodyweight support modality for treating knee osteoarthritis. The AlterG Anti-Gravity treadmill, along with conventional bodyweight supported exercise tools such as harness-based treadmills and pool-based exercise, offers the user the ability to walk with decreased forces through the knee joint so that they are able achieve the benefits of a regular walking program with decreased likelihood of exacerbating the symptoms of knee osteoarthritis and causing further knee damage. For some patients with advanced knee osteoarthritis, and associated pain, bodyweight support modalities may be the only option for establishing a regular walking or running program. Although all bodyweight supported exercise can be beneficial for knee osteoarthritis patients, not all bodyweight supported exercise approaches are created equal. While hydrotherapy uses buoyancy to help reduce some forces through the joint, the resistance of water means that the muscles must produce greater force and use abnormal firing patterns in order to accomplish the task of walking under water (ref2). This means that gait mechanics change, and the resulting muscle development does not translate perfectly to land-based walking. Additionally, since the muscles produce greater force as they engage around the joint, some forces acting on the knee joint actually increase, which is not desirable (ref2). In addition to non-optimal muscle strengthening and increased knee joint forces, pool based therapy is inconvenient, and it is also difficult to control the level of water resistance and thus effectively progress therapy. Putting aside the obvious comfort and setup issues with suspension-based treadmill exercise, this exercise modality suffers from one significant therapeutic drawback: While bodyweight suspension harnesses are effective in reducing the forces that act on the knee, they significantly alter normal gait mechanics (ref3). Altered gait mechanics change the way muscles fire, and therefore the resulting muscle development is not perfectly translatable to everyday life. The AlterG treadmill allows for essentially normal gait mechanics, leading to muscle strengthening that is directly translatable to land-based walking and running. The AlterG treadmill offers finely tuned control of bodyweight, from normal weight down to as low as 20%. This allows users to find the optimal (minimum) bodyweight reduction necessary for symptom-free exercise, and to finely progress therapy. The AlterG treadmill allows the user to experience the effect of specific and quantifiable levels of weight loss on knee osteoarthritis symptoms, which may be helpful in setting and motivating weight loss goals. The AlterG treadmill is comfortable and easy to use. 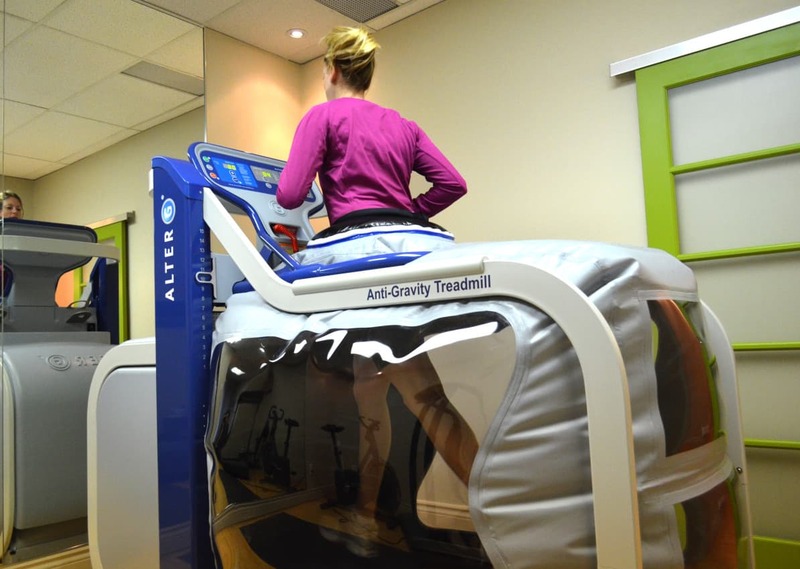 LBPP treadmills such as the AlterG Anti-Gravity treadmill are relatively new technology, and their therapeutic application is an ongoing area of clinical research. 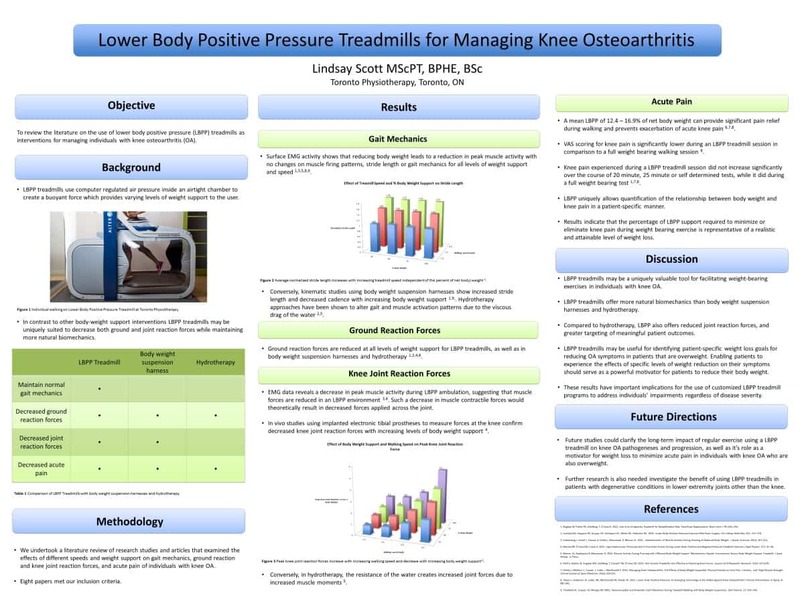 I was recently given the opportunity to review and present the research on the use of LBPP treadmills as a special intervention for managing knee osteoarthritis. See below for a summary of my presentation at the University of Toronto Collaborative Program in Musculoskeletal Sciences Annual Research Day 2016. Eastlack RK, Hargens AR, Groppo ER, Steinbach GC, White KK, Pedowitz RA. 2005. Lower Body Positive-Pressure Exercise After Knee Surgery. Clin Orthop Relat Res. 431: 213–219. Threlkeld AJ, Cooper LD, Monger BP. 2003. Temporospatial and Kinematic Gait Alterations During Treadmill Walking with Body Weight Suspension. Gait Posture. 17: 235–245.Ref Y: Fransen M., Crosbie J., Edmonds J.